As many of you know, back in 2007, I was fortunate to have the opportunity to create and organize a club specifically designed to help the Kawasaki Nomad owner. 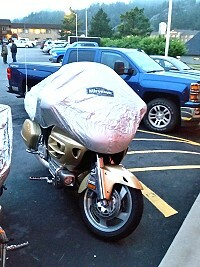 KawaNOW (Kawasaki Nomad Owners Worldwide) was born on June 7, 2007 and has quickly grown to over well over 3,000 members. 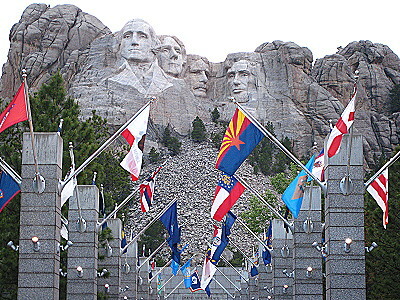 In 2009, the first National Rally was held in the Black Hills of Custer, South Dakota. Since then, the name of KawaNOw has been changed to The Vulcan Bagger Association or the VBA, for short. I have since stepped down as President of the VBA but I still try to be involved. After all, when you create something like this, it becomes your baby, no matter what brand of Motorcycle you ride. 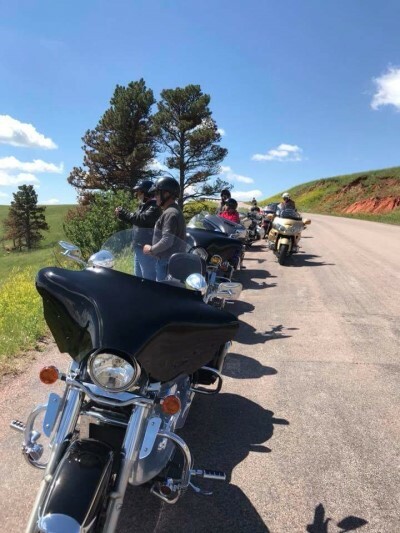 The current leaders of the VBA decided to hold one last Rally in 2018 and decided to hold it in the Black Hills of South Dakota. 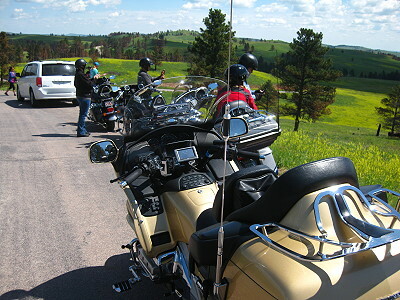 It's been 9 years since I rode the fabulous roads in the Black Hills. 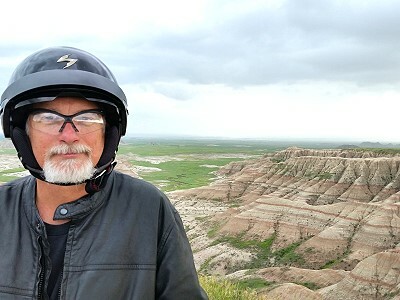 I decided that this time I would definitely ride the Badlands National Park, something I didn't have a chance to do back in 2009. Plans and rides were drawn up starting in November, 2017. The rally was held in June 18-21, 2018. 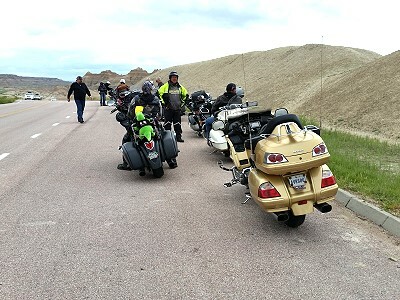 Over 50 people attended riding all brands and types of motorcycles. Although rain prevailed most of the trip, it didn't dampen the spirit of friendship among the attendees. The following is a trip report explaining my experiences on this trip... experiences I will not soon forget. The plan was for me to travel to Dave Marang's house on Friday and stay with him the night. Then several of us would leave from his home early Saturday morning to get a head start on the trip. 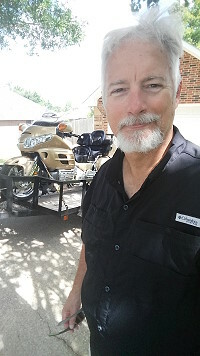 I decided rather than ride to Dave Marang's house in Oklahoma, I would trailer Cisco, my 2006 Gold Wing. My reasoning was simple. When I get back from the Black Hills to Oklahoma next week, I'll probably want to go ahead and travel home. I'll be tired from a 400 mile day on Cisco, so riding back in the truck and trailering will give me a break from the road. I spent the week before preparing and packing for the trip. I even did a couple of "mock" packings on Cisco to make sure I could travel with everything I needed. I've taken long trips on other bikes, but this will be the first long trip I've taken on Cisco. I got packed up, loaded Cisco on the trailer, loaded the truck and left for Dave's house about 11am, CDT. I arrived at his house about 5:30pm. I was the first one to arrive. Dave Jesse and his wife Crystal were to arrive later. I unloaded Cisco from the trailer and tucked the truck away on Dave's driveway for the week. Dave and Crystal arrived soon after and we spent the night talking and laughing. Tomorrow, we start the journey to South Dakota. We all got up early and did our final packing for the trip. Dave and Crystal were going to leave later than Dave and I and take a different route. Gene and his daughter, Kathryn were coming to Dave's house about 7am and the four of us would leave from there. It was Dave Marang's day to lead. 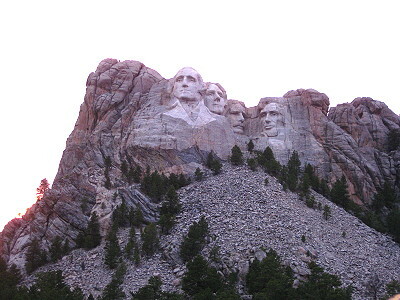 After stopping for fuel and eating breakfast at McDonald's, the four of us left for the Black Hills. 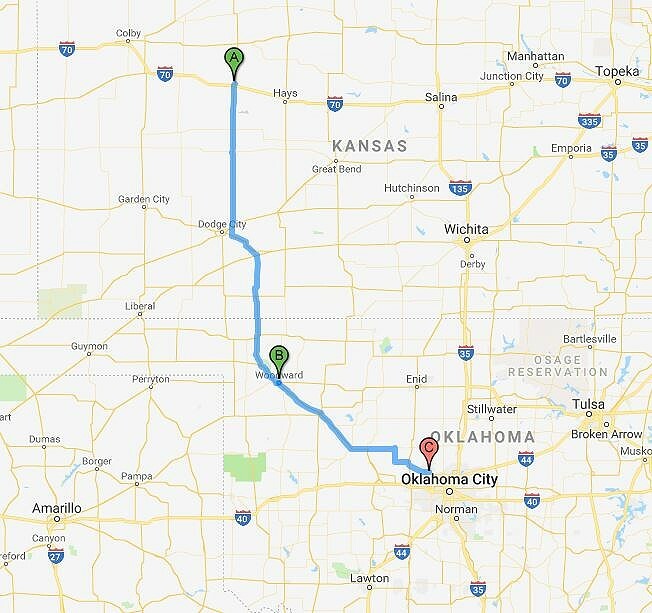 Today's ride would take us through Oklahoma and Kansas and into Colorado. Our stop for the night would be in Burlington. We stopped for fuel and lunch in Dodge City, Kansas. We arrived in Burlington, Colorado about 5:30pm, Mountain Time. 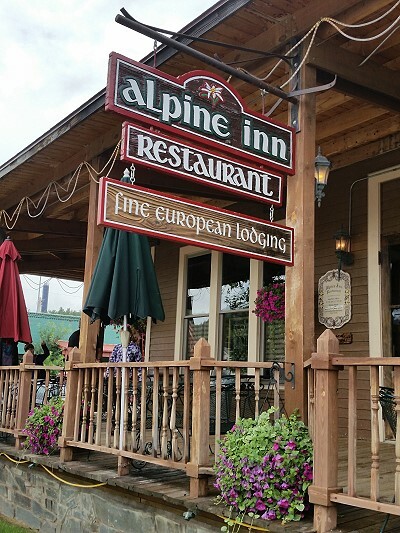 We checked in at the Best Western and went out for dinner at a local restaurant. Tomorrow we head for Custer, SD! While riding our route today, I couldn't help but take notice of all the wheat fields, corn fields and wind turbines. The wheat fields were beautiful, some ready for harvest, others still waiting. I guess that's why in the song America the Beautiful, Katharine Lee Bates decided to include the words, "amber waves of grain". I've never seen so much amber wheat some areas like in Kansas were already harvesting. Corn is a staple that America produces in large amounts and all of the corn fields I rode by were green and beautiful. Rows and rows of corn as far as the eye can see. The wind turbines were majestic! Dozens of them all over the Oklahoma and Kansas landscape. Each turbine can produce enough electricity to power over 350 homes. Amazing! I tip my helmet to all the farmers and ranchers along our route that produce the food and electricity that we so graciously consume. May your harvests always be abundant and the weather always cooperate! Dave, Gene, Kathryn and myself got up early and packed for the day's ride to Custer. It was my day to lead. 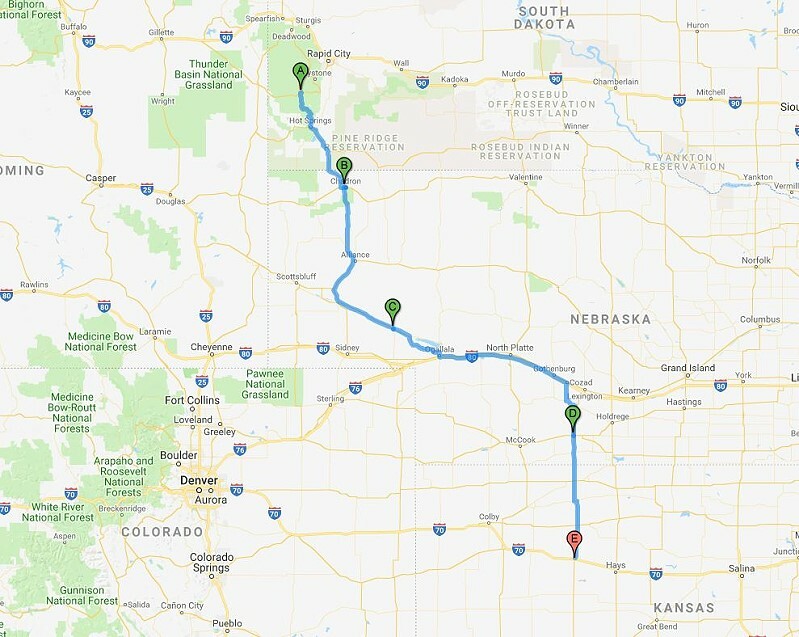 Our route would take us straight up North with stops in Julesburg, Nebraska for fuel, then on to Alliance, Nebraska for fuel and lunch, then on into Custer. Since we couldn't check in at the Best Western in Custer until after 4pm, we decided to leave a little later from Burlington. Weather was perfect when we left Burlington but gradually got worse as we headed North. After we left Oshkosh, Nebraska the temps turned colder and rain began to fall. By the time we reached Alliance, it was raining fairly heavy and temps dropped to about 57 degrees. 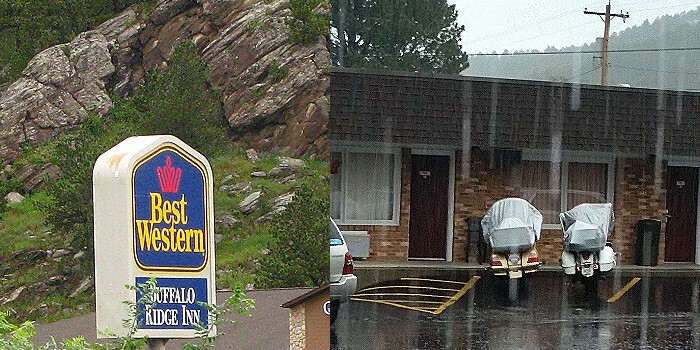 After stopping to slip on our rain suites and eating lunch in Alliance, we slowly made our way to Custer. We arrived about 4:30pm in Custer, wet and cold but glad we made it OK.
Well, there's not a whole lot I can say about Monday. It was cold and rainy all day! Actually Monday was not planned as a riding day but an arrival day for everyone attending. All day we just sat around, drank coffee and talked and laughed watching all the arrivals in the rain. Forecast kept promising a letup in the rain for Tuesday. We'll see. Forecast and radar was showing spotty rain for the day. There were several rain cells that would move through but other than that, no rain was predicted. 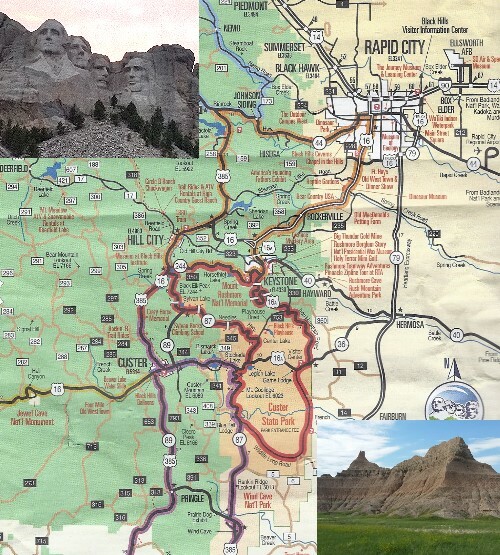 We decided to ride the Badlands ride which includes Wall Drug in Wall, South Dakota, then a tour through the Badlands National Park followed by a ride by at Scenic, South Dakota with stops in between. Noel Burke, a local resident who happens to be a member of the VBA was our leader. Noel did an excellent job leading all of us through the Badlands. His knowledge of the area and it's history was invaluable. 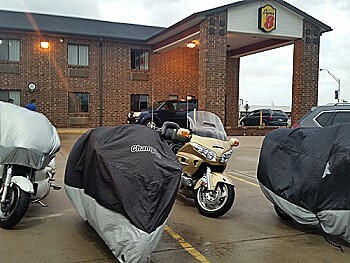 18 of us slid up our kickstands and left the Best Western at 9:15am and rode to the Flying J truck stop in Rapid City. 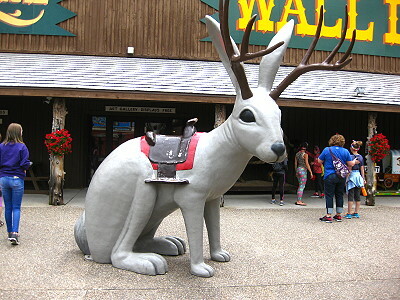 From there, we traveled down I-90 to Wall, South Dakota to visit Wall Drug. 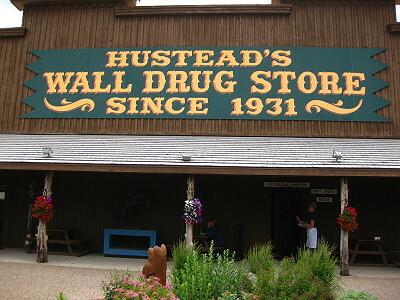 One of the world's most well-known tourist attractions, it's hard to believe Wall Drug Store got its start with something many wouldn't even turn their heads at today...the promise of free ice water. But in fact, the Husteads turned free ice water into a million-dollar idea with a little determination, quick thinking and a lot of signs. Signs with catchy jingles like "Get a soda . . . Get a root beer . . . turn next corner . . . Just as near . . . To Highway 16 & 14. . . Free Ice Water. 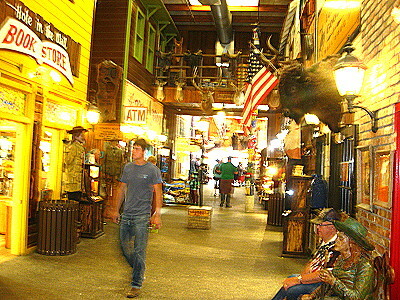 . . Wall Drug" drew weary travelers into the small-town drug store to enjoy a refreshing break. Today, more than 2 million visitors a year stop at the popular roadside attraction for a meal or activity, 5 cent coffee, and ice water - which is still free. 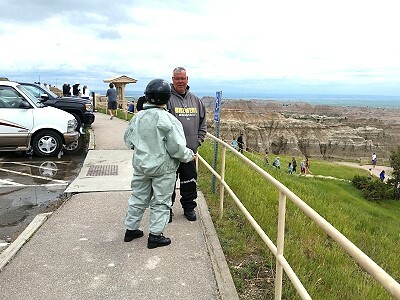 After eating lunch and shopping at Wall Drug, we left to take a ride through the Badlands National Park. Its dramatic landscapes span layered rock formations, steep canyons and towering spires. 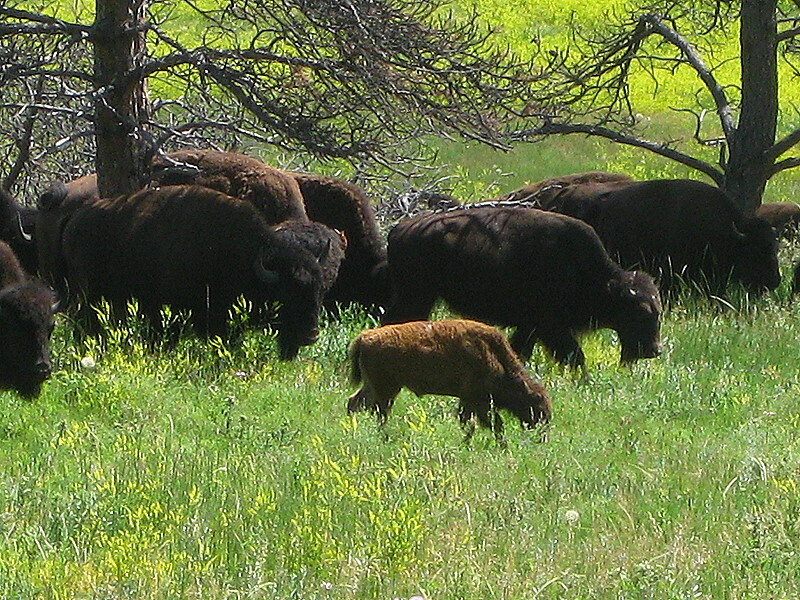 Bison, bighorn sheep and prairie dogs inhabit its sprawling grasslands. 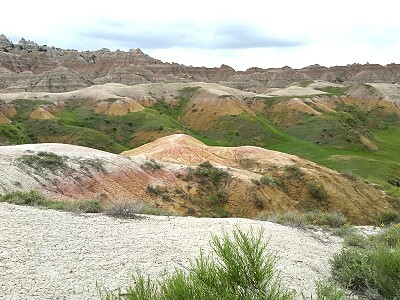 The Badlands Loop Road (Highway 240) winds past scenic lookouts. Several trails begin near the Ben Reifel Visitor Center. The Fossil Exhibit Trail is a boardwalk with displays on fossils uncovered in the park. 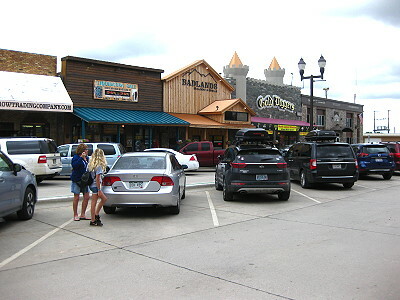 After leaving the Park, we rode through Scenic, South Dakota, well known for its' saloons in the past. They are all closed now and the town of Scenic has been sold. About that time it decided to rain. It rained on us all the way back to Custer. Wednesday was to be an "Off" day, meaning that no rides were planned. It was meant to be a day to allow everyone to do whatever they wanted to do. It was raining the first part of the day. Then rain was off and on. I decided to get my laundry done (I only brought enough clothes for 4 days, makes packing a whole lot better). 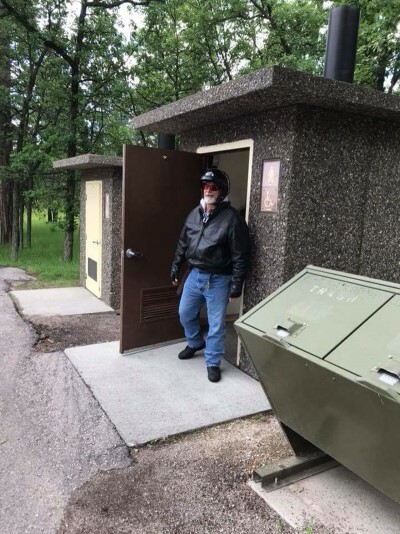 I found a laundry in Custer that allowed me to drop off my clothes and they would do the laundry for me. Life doesn't get any better. I also spent some time contacting the restaurant and making sure things were set for our Finale Dinner for Thursday night. It turned out I had to make some changes. We kept an eye on the weather forecast and radar for the day. It turned out that a clearing was coming. The rain was going to stop in the afternoon and a total clearing was predicted for Thursday. What luck! We decided to hold a cook out in the parking lot that we had planned previously and then some would ride to Mt. Rushmore at duck for the Lighting Ceremony. 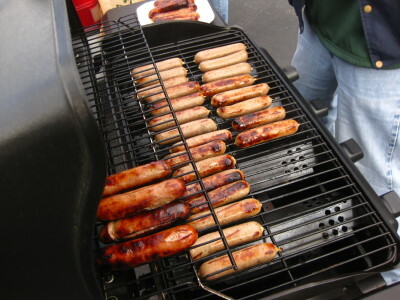 The brats that Mike Spilsky brought were great and he even grilled them for us! Mike also brought some Wisconsin string cheese which we all loved. Then, Noel Burke led us to Mt. Rushmore for the Lighting Ceremony. The ceremony was moving... especially when they played the video about America and asked veterans to come up to the stage for the flag retirement. If you ever travel to Mt. Rushmore, be sure to attend this ceremony. You won't regret it! Tomorrow will be the only day that we'll have sunshine and everyone was making plans for the day. Last day of the rally and the sun was out and temps were perfect! I decided to follow Jim, Annette, Mitch and Darlene on a ride through the Needles Highway, Iron Mountain Road and the Wilderness Loop. 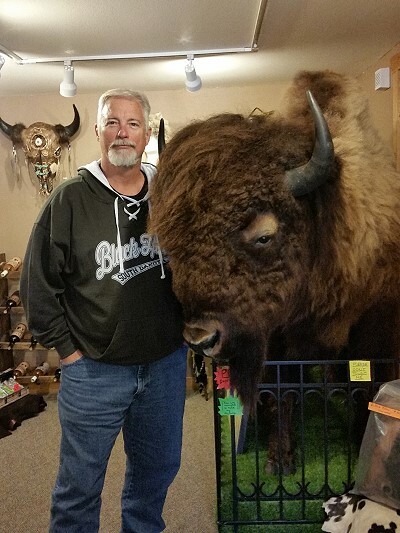 I couldn't think of a better way to finish the trip in the Black Hills. I setup my Go Pro and taped a lot of road action. (See video at top of report). Our ride was wonderful! Loved every minute of it. Nice twisties, sweepers and switchbacks. 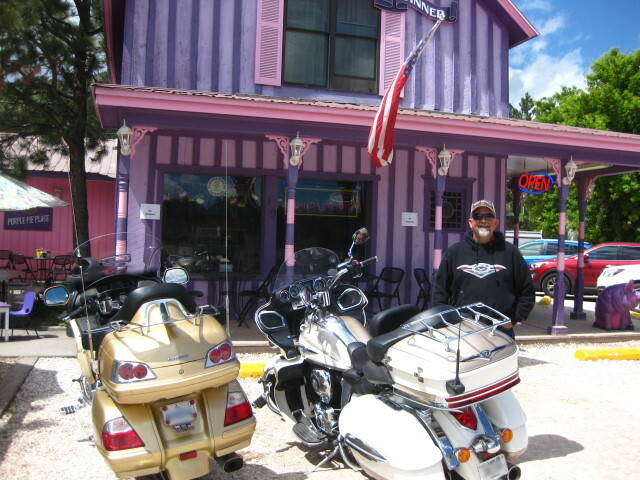 After the ride, Dave Marang and I ate lunch at the Buglin' Bull in downtown Custer. Then we hit the Purple Pie Place for some pie and ice cream. We had already been there two times before. 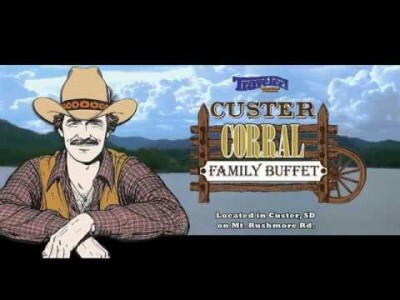 That evening, almost all attended the Finale Dinner being held at the Custer Corral Family Buffet. 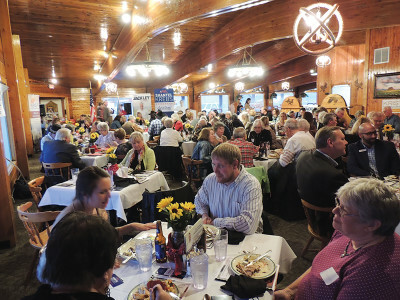 It was a good time and the food was excellent. After the dinner, many of us talked and laughed in the hotel parking. Tomorrow, we start heading home. And so it begins... the trip home. Dave, Gene, Kathryn and myself decided to get an early start. We checked out of the hotel, fueled and hit the road by 6am. We met the night before and formed a plan and route to get home with Gene leading. We took the same route home that we came up with but with a few changes. 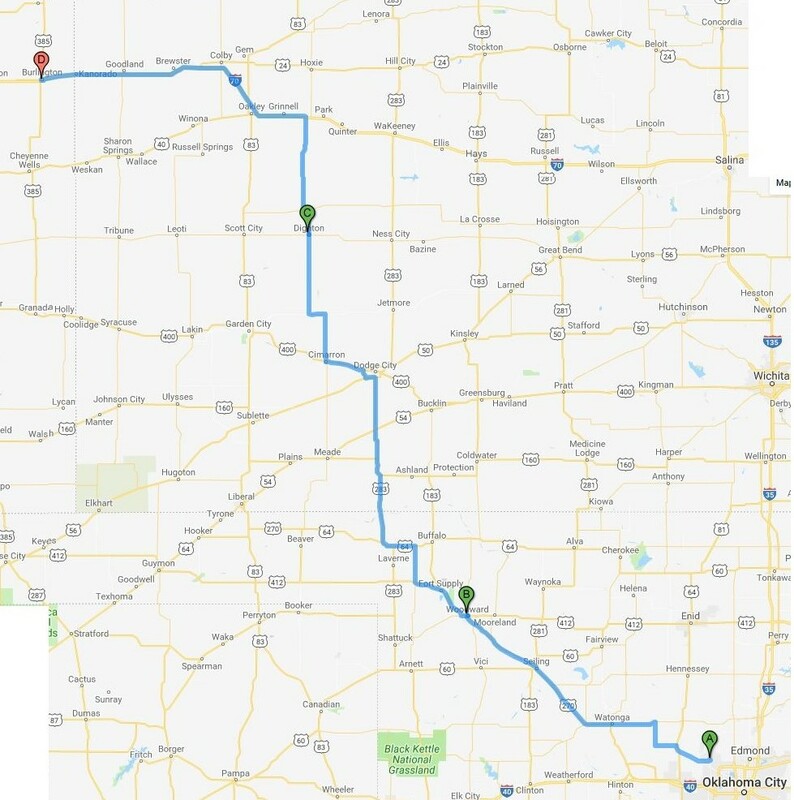 Our plan was to ride from Custer to Dodge City, Kansas and get a decent steak dinner in Dodge. It was an aggressive plan but one we felt we could do. We had good weather until we reached Kansas. That's when the bottom fell out. 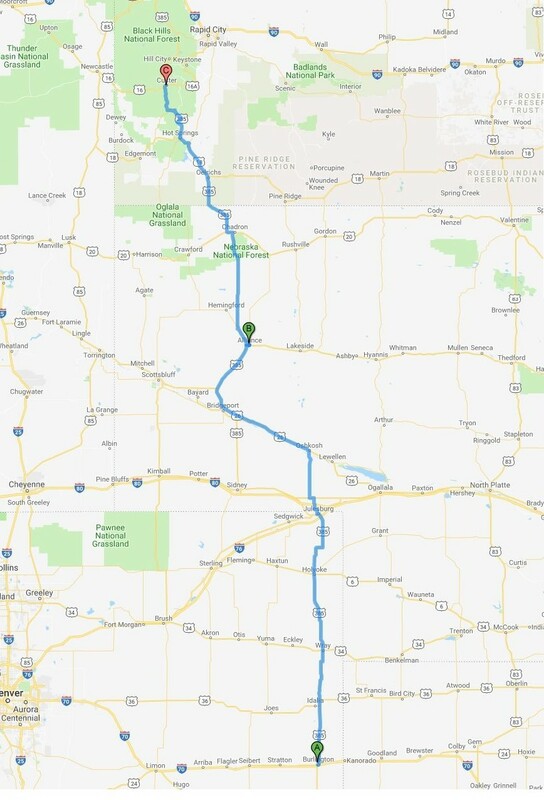 Luckily, we reached a small town called Wakeeney, Kansas where we had to stop for the night due to high winds, heavy rain and the chance for hail. We checked into the Super 8 motel in Wakeeney, Kansas dripping wet. Oh well, no steak tonight. We had to settle for pizza delivered. When we woke up Saturday morning the skies were clear but the temps were warm. Good day to ride and get home. All four of us left Wakeeney, Kansas about 6am with a target to get in Oklahoma about 1-1:30pm CDT. Without any interruptions from the weather or anything else, we made it. Gene and Kathryn made it to Blanchard, Oklahoma about 1:30pm... Dave and I made it to Piedmont, Oklahoma about the same time. Earlier in this report I mentioned that I trailered to Piedmont for the purpose of being able to trailer back home and get a break from the road. Well, that's what I did. It sure came in handy being able to truck and trailer the last 335 miles. I arrived home safe and sound around 7pm CDT. In conclusion, even though it rained everyday except for one, the rally was a huge success. Most of us were able to ride the roads we set out to ride and were able to meet and laugh with friends. The Black Hills area is absolutely beautiful. I put over 2,145 miles on Cisco. My thanks to Dave Marang and Dave Jesse for planning this rally. 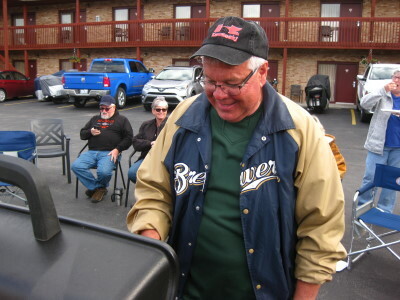 And my thanks to Noel Burke who lead us through several rides in the Black Hills and provided the grill and materials for us to have our cookout on Wednesday evening. I look forward to possibly going back one day. 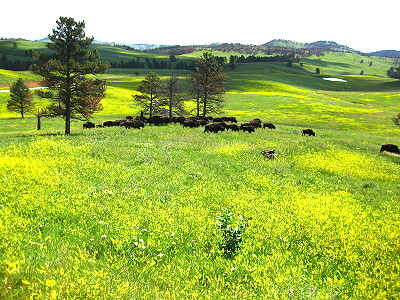 The Black Hills is beautiful country! The Purple Pie Place... The best place for dessert in Custer, South Dakota. All information on this website including photographs, graphics and documents reside with Robert Hilliard unless otherwise stated. All requests to use material from this page should be sent to Robert Hilliard.